Royalties and streams expose Franco-Nevada to the exploration and price optionality inherent with geologically favourable properties. They can often be registered on title to a property or in a secure fashion with less exposure to government resource nationalisation. They are not subject to operating or capital cash calls, making this a free cash flow business. Franco-Nevada can provide yield along with more upside than a gold ETF with less risk than an operating company. This business is truly a free cash flow business. We are effectively free of the need to directly fund unscheduled mining capital expenditures and other costs. Typically, we participate at the revenue line of operations and are not directly impacted by cost inflation. This allows our margins to fully benefit from rising commodity prices. Our business is high margin with low overheads enabling us to generate cash through the entire commodity cycle. Our many assets provide exploration optionality by covering over 44,000 square kilometres of geologically prospective lands without any direct carrying, exploration or development costs. Our business is scalable allowing for the acquisition of more interests than an operating company can effectively manage. A more diversified portfolio reduces overall risk. Management has the benefit to be able to focus on growth as we do not have responsibility for day-to-day operational or development decisions. Since our IPO in December 2007, Franco-Nevada’s share price has outperformed both gold and other gold equities. Over those ten years our margins have remained high, our overhead has remained low and our effective tax rate has remained stable. The Company has been able to increase dividends in each of the past ten years. Franco-Nevada Corporation’s roots go back to the early 1980s when Seymour Schulich and Pierre Lassonde founded the original Franco-Nevada with an initial capitalization of $2 million. That company created the mining royalty business. It was the leading public mining royalty company until 2002 when it was acquired by Newmont Mining for $2.5 billion. The original Franco-Nevada team continued to manage royalty assets as part of Newmont Capital. In 2007, Newmont offered a package of many original Franco-Nevada royalties along with other royalties for sale. The original Franco-Nevada team incorporated a new Franco-Nevada, launched an initial public offering (IPO) and on December 20, 2007 acquired the royalty portfolio for $1.2 billion. It trades under the symbol FNV on both the Toronto and New York stock exchanges. Franco-Nevada has expanded the original IPO portfolio to become the leading gold royalty and streaming company with a year-end market capitalization of over $14 billion. Its business model provides investors with gold price and exploration optionality with less exposure to operating risks. It uses its strong free cash flow to expand its portfolio and pay dividends. 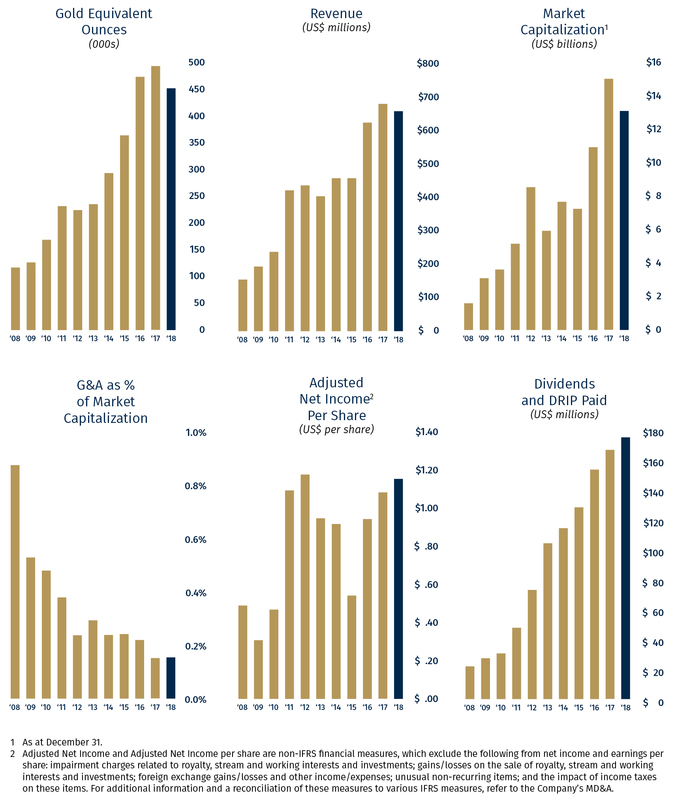 Since its IPO, Franco-Nevada’s share price has outperformed the gold price and all relevant gold equity benchmarks.